I have fond memories of reading the book to which this one is a sequel – The Scarlet Pimpernel – one hot summer in between high school semesters. 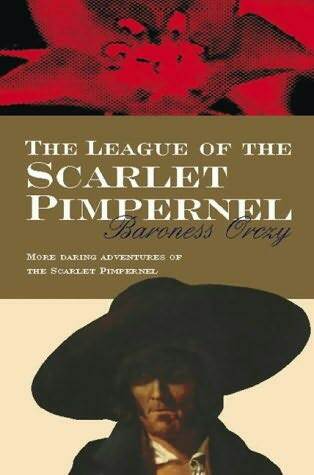 I was reading anything I could find about the French Revolution, and a librarian at the Gates Library recommended Baroness Orczy and the Pimpernel, which I devoured. I had not realized there was a sequel until I started creating the lists for this reading project, and was delighted to find my old friend Percy Blakeney among the choices. In fact, I discovered there are a great many sequels to the original Pimpernel, which I’m sure will lead to much more reading for me! The League of the Scarlet Pimpernel picks up with Sir Percy still rescuing unfortunate maidens and righting wrongs in post Revolution France, albeit in a collection of short stories instead of one longer novel. Each vignette has Percy or another member of The League righting wrongs committed against members the aristocracy or members of their staff. Children are rescued, fortunes restored, and lives set aright, all at the hand of the man with the twinkling blue eyes that can turn to steel in a second. An entertaining read for fans of the spy genre and historical fiction.